With this SaltPlus "Trapez V2" Cassette Hub - Oilslick you get a high quality manufactured cassette hub at a very good price-performance ratio. The body is made of lightweight 6061 aluminum and the heat treated 14mm CrMo male hollow axle and high quality sealed bearings provide best stability and durability. 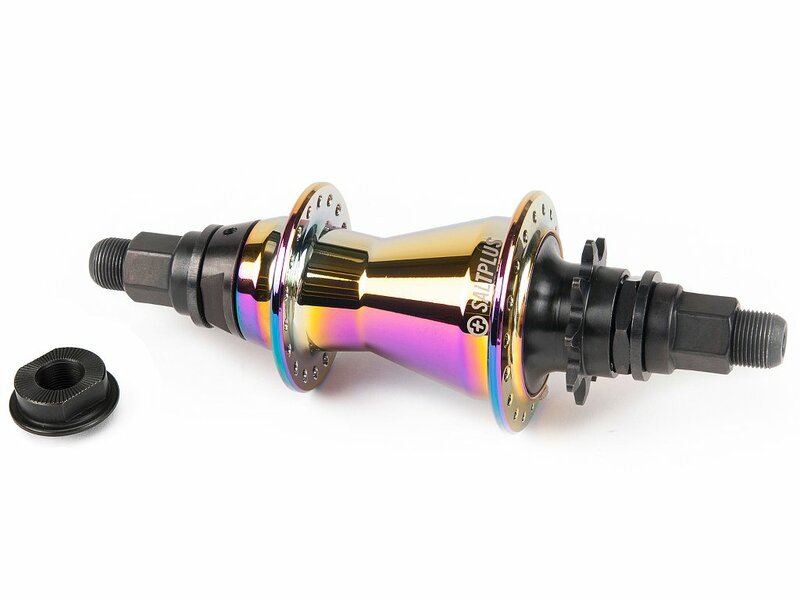 The driver SDS system (Switch Drive System) of this SaltPlus "Trapez V2" Cassette Hub - Oilslick allows you to use this cassette hub optionally as RHD or LHD hub. With the separately sold Salt Plus "Trapez" Hubguard - Driver Side, Salt Plus "Universal PC" Hubguard and Salt Plus "Universal" Hubguard you can protect both sides of this cassette hub. This SaltPlus "Trapez V2" Cassette Hub - Oilslick inludes a additional special CrMo cone which allow you to equip the hub with the separately sold Salt Plus "PRO" nylon rear hubguard.